AAI Recruitment 2019: Good news for the Aspirants looking for Central Government jobs, now Airports Authority of India (AAI) published an official notification for 264 post to fill the Apprentice, work in Mumbai. Candidates must go through the official AAI recruitment notification thoroughly before apply for Apprentice post. AAI Apprentice job application is collected through Offline(by post) mode only. In the recent Recruitment Notification, the following vacancy details given by the Airports Authority of India (AAI) and aspirants should go through the vacancy details and eligibility details for more detail in AAI notification link given below before applying. Aspirants meet the education qualification of Airports Authority of India (AAI) only apply for the Apprentice job. AAI notification 2019, education qualification are given below. Public Relations Graduate, with Degree or PG Diploma in PR or journalism from a recognized institution. Airport Terminal Mgt. 10+2 with 3 years experience. Diploma in Hotel Management OR Graduate with Diploma in Sanitation or Public Hygiene/ Housekeeping from a recognized institution. Finance Graduate preferably B.Com with Computer training course of 3 to 6 months. Communication Navigational Serveillance Bachelor Degree ln Engg or Tech. in Electronics or Tele Communication or Electrical with specialization in Electronics from a recognized institution. Engineering Civil Bachelor Degree in Engg or Tech in Civil from a recognized institution. Engineering Electrical Bachelor Degree in Engg or Tech in Electrical from a recognized institution. Engineering Civil Diploma in Civil Engineering. Engineering Electrical Diploma in Electrical Engineering. Motor Vehicle Mechanic Certificate in Vocational Course ( in Mechanic-Motor Vehicle) involving 2 years of study after the completion of a secondary stage of school education or 10th Class examination recognized by the All India Council for Technical Education (AICTE)/ State Council of Vocational Education. Diesel Mechanic Certificate in Vocational Course (in Mechanic-Diesel) involving one year of study after the completion of a secondary stage of school education or 10th Class examination recognized by the All India Council for Technical Education (AICTE)/ State Council of Vocational Education. Auto Electrician Certificate in Vocational Course(in Motor Vehicle Mech. or Electrician or Electronics-Mech.) involving one year of study after the completion of a secondary stage of school education or l0th Class examination recognized by the All India Council for Technical Education (AICTE)/ State Council of Vocational Education. Tractor Mechanic Certificate in Vocational Course (in Mechan ic-Tractor or Farm machinery) involving one year of study after the completion of a secondary stage of school education or 10th Class examination recognized by the All India Council for Technical Education (AICTE)/ State Council of Vocational Education. Communication Navigational Surveillance Certificate in Vocational Course (in Electronics/ Telecom mun action/ Radio Engineering) involving one year of study after the completion of a secondary stage of school education or 10th Class examination recognized by the All India Council for Technical Education (AICTE)/ State Council of Vocational Education. Engineering Electrical Certificate in Vocational Course (in Electrical) involving one year of study after the completion of a secondary stage of school education or 10th Class examination recognized by the All India Council for Technical Education (AICTE)/ State Council of Vocational Education. Aspirants who want to apply for AAI Apprentice 2019, must attain the following age limits given by Airports Authority of India (AAI). The application fees for Airports Authority of India (AAI) Apprentice 2019 differ according to various categories. No application fees for AAI Apprentice. 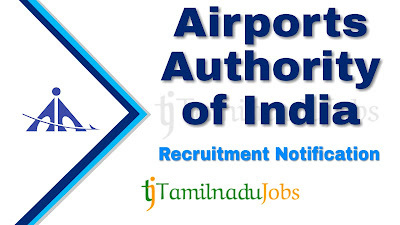 Airports Authority of India (AAI) is announced the recruitment for the Apprentice to full fill their 264 posts. Aspirants have to pass the following selection process given by Airports Authority of India (AAI) to get Apprentice job. For more detail and correct information check in the official notification of AAI. How to Apply AAI Apprentice 2019? Step 3: Fill the details required by AAI in the form. Step 5: All required documents should be sent to address given in the official notification of AAI Apprentice on or before 18-02-2019 and in an envelope should mention the "Application for the post of _____"